North Coast Tsunami Football Club forwards (in white) go for the header on a corner kick during their recent match against Football Club Santa Clarita. Alan Exley acts a lot like Obi-Wan Kenobi -- the Alec Guinness one, not that other guy. He's calm, speaks thoughtfully and has a hearty laugh that crinkles his whole face. Slowly pacing the sidelines at the Humboldt State Redwood Bowl, he even kinda looks like old Ben. His hair and beard are leaning toward white, although it probably still says "red" on his driver's license. He has blue eyes. Sunglasses rest on his forehead, and he's wearing a blue Adidas tracksuit. Behind him, the young men of the North Coast Tsunami Football Club scrimmage on the field, shouting, "Man on!" "Again, again!" Like Kenobi, Exley came out of retirement to coach a promising up-and-comer. 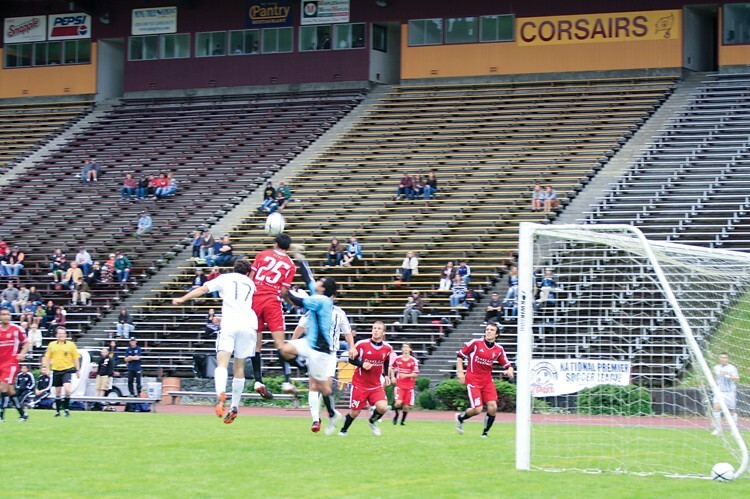 The Tsunami, Humboldt's first semi-pro soccer team, is halfway through its inaugural season. Exley, the owner and head coach, hopes that in a few years' time the Tsunami will occupy a place in the community's heart in the same way as the Humboldt Crabs baseball team. Someone kicks the ball out of bounds. "Alan!" they yell. It rolls past Exley, close, an easy stop, but he ignores it, barely looking up as the ball-shagger hustles by. "It went that way," Exley says, to laughter from the field. Like a Jedi. The Tsunami's story began with the end of the College of the Redwoods men's soccer program, although the team is more than just a simple resurrection. CR hired Exley in 2009 to start the men's soccer program. Before that, he'd been reffing high school and college games in a sort of wind-down after his retirement from 20 years of coaching at HSU. But just two years later, in spring 2011, CR told him it couldn't afford to keep the program going. Exley didn't want to see the CR players hang up their cleats or, worse, leave the area for greener stadiums. "It really left those guys in the lurch," he says. "I just couldn't abandon them." The answer, he decided, would be to start something entirely new and independent. Retirement could wait. He started shopping around, eventually setting his sights on the National Premier Soccer League. The league, which occupies the fourth-highest level of soccer in the country, is semi-pro, making it suitable for students and players with jobs. More importantly, it's an all-ages league. "For such a small area, you need to be able to use your entire pool," Exley says. The players on his team are as young as 16 and as old as 34. One of the younger players is Pearce Narum, 17, an Arcata High senior. Last year Exley, who reffed Narum's high school matches, asked Narum to join the Tsunami after seeing him play. Narum, No. 19, is glad he did. "I'm playing at a lot higher level," he says. He's had to make some sacrifices. "I have to miss school on Fridays. It's not bad, though." For younger players like Narum, the Tsunami provides an opportunity for exposure at bigger tournaments, where the talent scouts hang out. Meanwhile, older players can hone their coaching chops while mentoring younger teammates. "I'd like to be a coach at some point, and I think the more experience the better," says Peter Fuller, 35. Fuller played under Exley for HSU back in the late '90s, and he says that it's been great helping his old college coach fulfill a longtime dream. "I remember road trips where he would talk about [starting a team]. At that point I was like, ‘Oh, that's cool, right on man,'" Fuller says, laughing. The Tsunami, which was admitted to the league in October, is the first new team to join -- all the others were established before they entered. By November, Exley had a full roster, and the team started practicing. They played their first game in March, losing 0-2 to Real San Jose. Now all that remains, Exley says, is to see whether such a small area can sustain a nonprofit soccer team. "With lower-level sports, finances is always the issue," he says. He's optimistic, though. "Humboldt County has been a very generous county." Bear River Casino has agreed to house visiting opponents -- a major expense -- and most players have found $500 sponsors to help with travel costs for away games. Additionally, Adidas has agreed to support the team with a $3,000 annual sponsorship. Thus the tracksuit. In many ways, Exley says, the team is an investment in Humboldt County. With more than 3,000 active players, he says, the county has one of the highest rates of soccerism in America. But before Tsunami, there were few local options for serious players beyond high school. Exley gestures to the field. Many of these young men were offered college scholarships, he says, and if not for Tsunami they'd already be gone. Attending a game is a new community event, he says, a chance for young players and families to watch a high level of soccer. The home games so far have attracted between 200 and 300 people on average. Exley's hoping that number will grow. The team has had a rough season so far, with seven losses, one tie, and one win. That's to be expected with a new team, Exley says, adding that the teams they've played are more experienced, have played together longer, and often have the advantage of bigger populations to pull players from. What's inspiring, he says, "is the thought that in two or three years we'll be playing at that level." During its June 2 match against FC Santa Clarita, Tsunami players displayed both their weaknesses and their potential. Santa Clarita dominated possession for much of the game, and the ball was mostly on the Tsunami side of the field. Despite its struggle to keep the ball, the Tsunami held its own through the first half, which ended 1-1. In soccer, being one goal behind isn't that bad. After Santa Clarita scored early in the second half, the Tsunami fans seemed to still be hopeful. It's difficult, however, to recover from a two-goal deficit. A disputed call by the ref in the last 10 minutes resulted in a penalty kick from the Tsunami's 18-yard line. It was an easy goal, and the game was for all intents over. After the match, Exley seemed disappointed. "I don't think the 3-1 score was reflective of the game," he said. A 2-1 loss against the second-ranked team would have actually looked pretty good for the Tsunami, he said, while the 3-1 loss didn't. "They deserved the second goal, but the third ..." he trailed off. But midfielder Peter Darquea, No. 15, said that right now it isn't just about the final score. "It is our first year in the league," said Darquea, 21. "I don't think we're so much worried about wins or losses. Our goal is to improve every weekend, and I think we have." The team plays next at the CR stadium this Saturday at 1 p.m., against Real San Jose.